The Romans mainly drank wine and water as their main drinks. Their wine could be laced with spices and honey to boost the taste. However, drinks such as milk were considered uncivilised, and hence were only used for medicinal purposes and making cheese. 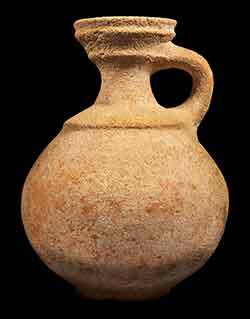 Romans primarily drank wine mixed with water. Soldiers and slaves for whom wine was difficult to get would often drink a vinegar-water mixture called posca. Posca was a popular drink among ancient Roman soldiers and poor peasants. It was usually made by watering down low quality wine and then adding spices to make it taste better. Julius Caesar did not drink wine, he drank water mixed with vinegar or lemon juice. 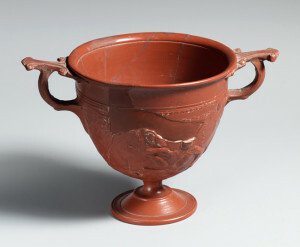 Wine was such a popular drink among the Romans that it could be called their national drink! Wine was normally mixed with water immediately before drinking, since the fermentation was not controlled and the alcohol grade was high. Wine was sometimes adjusted and "improved" by its makers: instructions survive for making white wine from red and vice versa, as well as for rescuing wine that is turning to vinegar. Wine was also variously flavored. For example, there was passum, a strong and sweet raisin wine, for which the earliest known recipe is of Carthaginian origin; mulsum, a freshly made mixture of wine and honey; and conditum, a mixture of wine, hod matured. One specific recipe, Conditum Paradoxum, is for a mixture of wine, honey, pepper, laurel, dates, mastic, and saffron, cooked and stored for later use. Another recipe called for the addition of seawater, pitch and rosin to the wine. A Greek traveler reported that the beverage was apparently an acquired taste. Sour wine mixed with water and herbs (posca) was a popular drink for the lower classes and a staple part of the Roman soldier's ration. Beer (cervisia) was known but considered vulgar, and was associated with barbarians — Guess what, they drank it. The Spanish cerveza comes from the Latin word cerevisia (of beer), giving some indication of the long span human beings have been enjoying the drink. 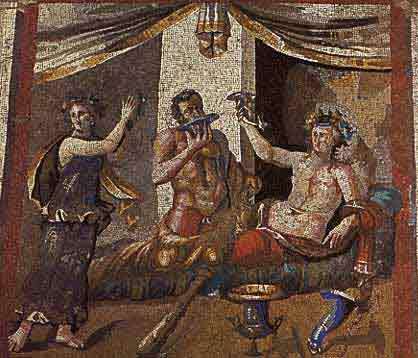 The Romans favored strong wine over beer and considered the grainy brew an inferior drink of barbarians. The Roman Emperor Julian even composed a poem extolling the virtues of wine as a nectar while noting that beer smelled like a goat. That the Romans did brew beer, however, is evidenced by finds at the Roman outpost in Regensburg, Germany (founded in 179 CE by Marcus Aurelius as Casta Regina) as well as at Trier and other places. When the Romans came to Britain, they found that beer was esier to come by than wine. Locally, there was beer and the taste for it was soon aquired. Brewing in Britain was probably well established when the Romans arrived in 54 BC, and certainly continued under them. 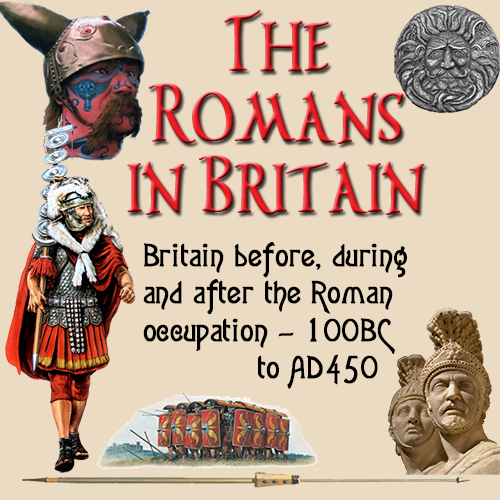 In the 1980s archaeologists found the evidence that Rome's soldiers in Britain sustained themselves on Celtic ale. A series of domestic and military accounts written on wooden tablets were dug up at the Roman fort of Vindolanda, at Chesterholm in modern Northumbria, dating to between AD90 and AD130. They reveal the garrison at Vindolanda buying ceruese, or beer, as the legions doubtless did throughout the rest of Roman Britain, almost certainly from brewers in the local area. One list of accounts from Vindolanda mentions Atrectus the brewer (Atrectus ceruesar[ius), the first named brewer in British history, as well as the first known professional brewer in Britain. The accounts also show purchases of bracis or braces, that is, emmer wheat (or malt), doubtless for brewing. Quite possibly the garrison bought the malt, and hired a local brewer to make beer from it for the troops. In Roman Britain, brewing, both domestic and retail, must have been widespread: remains indicating the existence of Roman-era malting or brewing operations have been found from Somerset to Northumberland, and South Wales to Colchester. In the third and fourth centuries AD Roman hypocaust technology, for supplying central heating to homes, was adapted in Britain to build permanent corn dryers/maltings, and the remains of these double-floored buildings, with underground flues, are found in Roman towns as well as on Roman farms. British brewing is generally thought to have been part of a wider Celtic tradition. Since this was well before the introduction of hops, other flavourings such as honey, meadowsweet and mugwort may have been used. Even so, the Romans were brewing cerevisia quite early as evidenced by the tomb of a beer brewer and merchant (a Cerveserius) in ancient Treveris. Excavations of the Roman military encampment on the Danube, Castra Regina, unearthed evidence of beer brewing on a significant scale shortly after the community was built in 179 AD by Marcus Aurelius. When it came to making a beer, the Romans used the techniques and equipment that worked the last time and relied on locally grown ingredients. Therefore, each town’s beer had a unique taste and appeal.